Slot designers never get tired of the classics. This is evidenced by the subject of today’s slot machine review. 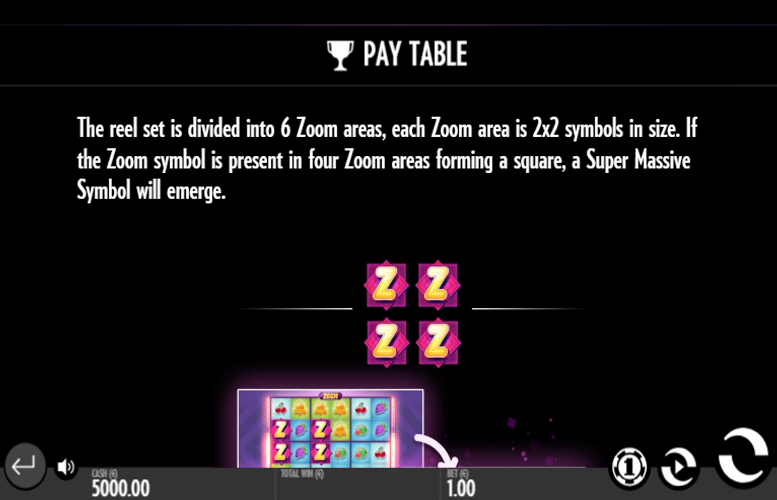 The Zoom title from Thunderkick is yet another variation on the classic fruit machine theme. However, thanks to a few design touches, it feels much more 21st than nineteen hundreds. The title marries the old with the new perfectly and features a vintage visage combined with a modern take on bonus features that feels anything but dated. The action also takes place over a bumper game board that measures six symbols by four. This is further divided into six smaller squares for the main special feature. However, we’ll discuss that in more detail later. Interesting take on bonus features. We’re not sure we’ve ever seen a game use the same Zoom feature dynamic before. Established theme but modernised. 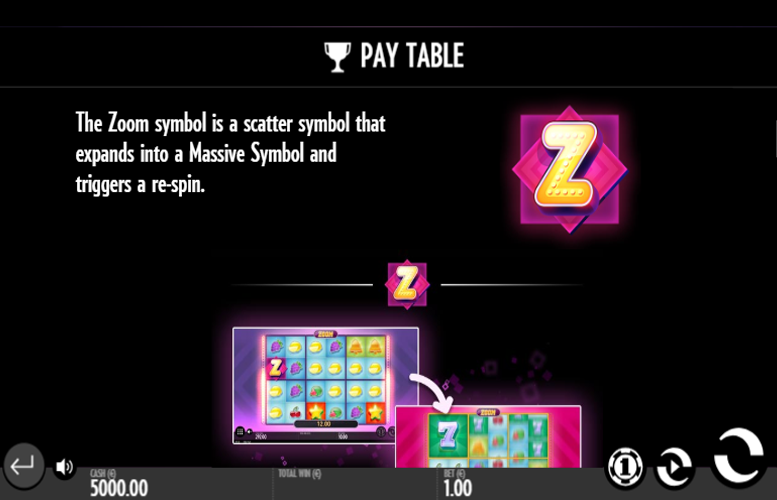 The Zoom slot machine marries the format of a classic fruit machine with the gameplay features of a modern video slot. Woefully low main game prizes. We say this about a lot of Thunderkick’s collection but at 12.5x the total bet, Zoom is certainly one of the worst offenders in this regard. Far from the most ambitious looking slot machine we’ve ever seen. 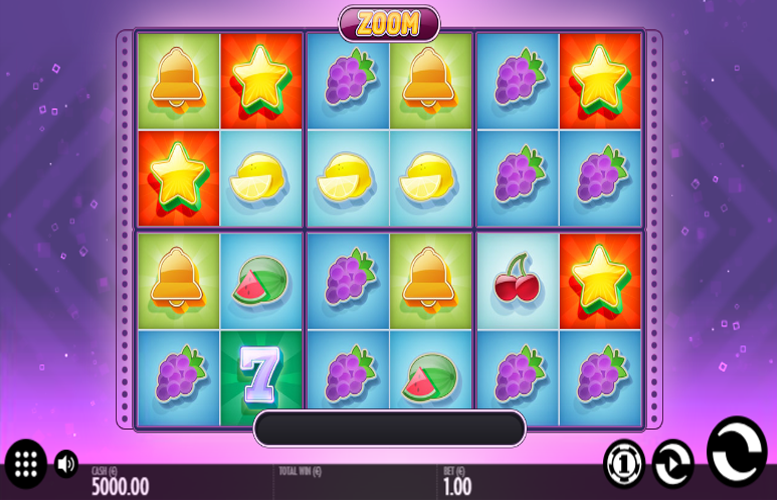 In fact, even other classic fruit machine-inspired titles often look more visually appealing than Zoom. Limited number of side games. With just one special feature, the Zoom slot machine couldget stale incredibly quickly. Replay value might well be low with this one! The top jackpots on the Zoom slot machine by Thunderkick are each awarded for matching six-of-a-kind of a symbol along one of the 64 win lines. Each of the symbols representing these larger jackpots are those commonly seen on classic fruit machines in brick-and-mortar casinos or British pubs. “Wild” = 12.5x the total bet. Star = 12.5x the total bet. Lucky Number Seven = 7x the total bet. Liberty Bell = 5x the total bet. Using a combination of bonus / free spins features the max win per spin is 1,500x line bet. The Zoom symbol is represented by a “Z” on a purple background. It is a “scatter” symbol that will expand into a Massive Symbol and trigger a re-spin. This massive symbol can form some huge winning combinations across multiple lines. The reel set is subdivided into six Zoom areas. Each Zoom area is two by two symbols in size. If the Zoom symbol is present in four areas forming a square, a Super Massive symbol will emerge. 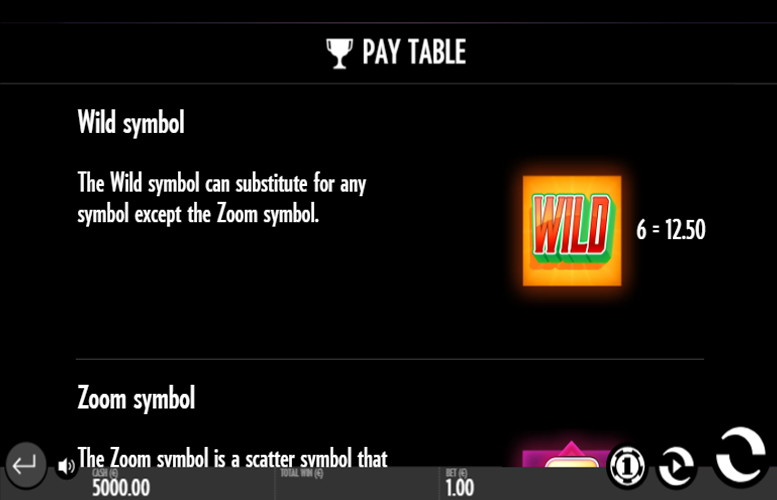 Along with those symbols that grant the highest prizes on the Zoom slot machine, there are also those that award smaller payments. For these lower paying symbols, game designers Thunderkick opted not to borrow from a strong trend in modern, online slot machines and use the face cards from the upper end of a standard deck. Grapes = 4x the total bet. Watermelon = 3.5x the total bet. Lemon = 3x the total bet. Cherries = 2.5x the total bet. Unlike many online slot machines, the designers of the Zoom title did not include many options dedicated to alternate bet distributions. 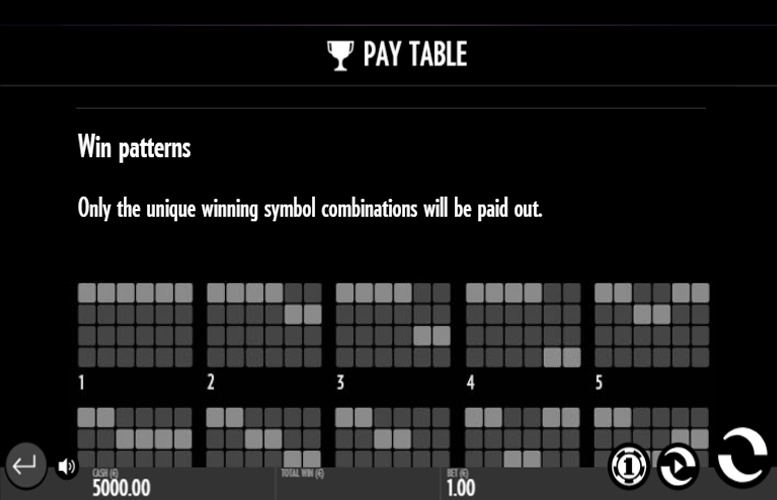 Some machines allow players to adjust the number of win lines player, along with the amount bet on each one. Unfortunately, Thunderkick do not offer their players quite the same level of control over how they spread their bets out on Zoom. Instead, players are presented with 12 total bet amounts to select from. 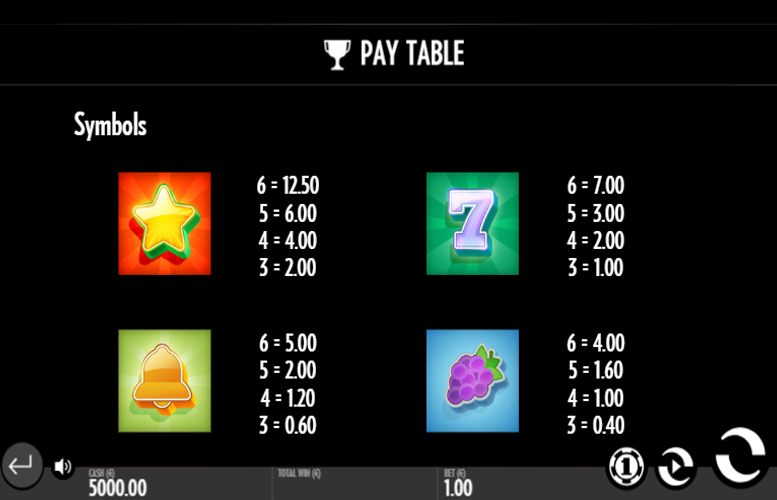 The minimum total bet amount offered per spin is just 10p. Meanwhile, the maximum is a reasonable £100. Players of most budgets should find these limits are plenty. However, those used to playing nose-bleed stakes might find them a little limiting. If you love classic fruit machine-style gambling but wish the games were modernised, you’ll probably love the Zoom slot machine. For its symbols, you can expect to see the likes of watermelons, cherries, lucky sevens, and liberty bells. However, rather than being yet another “spin and win” style game, Thunderkick have included some great special features. These help to create a game that is more fun to play than its stylistically similar predecessors. That said, the slot isn’t perfect. It suffers from that common fault of manyThunderkick games – the main game prizes are terribly low. Additionally, there hasn’t been a great deal of effort put in to modernising the symbol designs themselves. The artwork is kind of basic and this is certainly a let-down. Despite its weak artwork, the game will certainly find some fans. It plays well enough on first visit and the special features make it entertaining. However, a lack of variety here will mean that the title will probably get old quickly. This game has a rating of 3 / 5 with 309 total reviews by the users.